Posted Apr 12, 2019 by Eds. Venezuela is being subjected to intense chaos therapy, a systematic media campaign, permanent pressure, obliged to use force to control sectors of the middle class, all part of a well-crafted plan. The economic war causes scarcity; consumption habits rooted in bourgeois culture are affected; constant attacks generate feelings of insecurity, fear, and anxiety, keeping persons focused on hatred, leading them to the limits of endurance; they are lied to and mobilized; skillfully pulling the strings of hatred, the population becomes a time bomb, ready to explode at any moment. The ground is prepared with the aim of provoking mental confusion, before an avalanche of events, messages, fake news, shortages, the lack of water, blackouts, attacks, etc. “Citizens fall into such a state of regression that they cannot think rationally or protect their interests,” read CIA manuals. In such a state many people are easily manipulated and, according to the intelligence agency, can renounce their beliefs. This is how the strategy works. A terrorist attack, a market collapse, war, a hurricane, power outages, etc. drag the country’s population into a state of collective chaos, to break the will of a society, undermine its capacity for mobilization and response. During the 1973 coup in Chile, as the armed forces deployed a contingent to attack and savagely bomb the Moneda Presidential Palace, repression against the population began. Intent upon causing terror, paralysis, factories and neighborhoods were attacked, hundreds of persons were arrested and assassinated in the first hours. Tanks, planes, artillery and hundreds of soldiers were mobilized against a handful of the faithful alongside their President. The country had been living with constant tension for months, and rumors of a coup were rampant. The military unleashed vicious repression against the Popular Unity party, arresting thousands and leaving hundreds dead. The plan was crafted well in advance. The names of people and places were identified to determine the exact way any resistance would be neutralized. Witnesses have testified that torture was directed more at breaking individuals than obtaining information. Widespread power outages occurred in Chile, as well, prior to the coup, with the goal of creating confusion, fear, and anxiety in the population. In Argentina, the coup environment was prepared in advance as well, in detail. The armed forces knew exactly where to find trade union leaders, the groups of workers resisting the neoliberal plans of the military and its bosses. The machinery of terror sought to eliminate an entire generation physically and psychologically. The experience of the CIA in torture, the experiments used to dehumanize prisoners, deprive them of their identity, erase their memory, served as the model for this kind of shock therapy. Electric shock, submersion, sleep deprivation, prolonged soil ingestion, sensory isolation – practices that are used today on prisoners in the illegal prison in Guantánamo – were used. In all South American countries, transnational corporations not only offered their facilities to create torture centers, as was the case with Ford, but collaborated actively with the military, handed over union leaders, “annoying” workers and participated in the plan to construct a neoliberal state. The kidnapping of prisoners’ children born in captivity, placing them with new families of the right (military, civil servants, politicians) was part of the project meant to destroy a generation. The clearest example of this phenomenon was September 11, 2001. For millions of people, the world that was familiar to them exploded into a thousand pieces and gave way to a period of profound disorientation and regression that the Bush administration knew how to exploit with skill. Suddenly, we found ourselves living in a kind of Year Zero, in which everything we knew could be disparagingly dismissed with the label of “before 9-11.”(1). The shock doctrine establishes this process step by step, in its attempt to achieve on a massive scale, what individual torture accomplishes in the interrogation room: destroy the ability of a society to respond, end all feelings of solidarity and collective support, to transform the individual into a fearful, egotistical being, whose only object is to survive. With the world preoccupied with deadly new cultural wars, the Bush administration was able to achieve what it had scarcely dreamed of before September 11, waging private wars abroad and building a corporate security apparatus within U.S. territory. Against all imperialist logic, Venezuela resists. Washington has encountered an obstacle that cannot be overcome with supercomputers, superagents, or chaos professionals: the people’s refusal to be subjugated, the determination to resist. Millions of men and women mobilizing solidarity to resist the masters of terror, chaos, and ungovernability. After the sabotage against the Guri hydroelectric system, the President of the Bolivarian Republic of Venezuela, Nicolás Maduro, urged the academic community to resume school activities, which had been suspended in the wake of attacks on the national electrical grid. Schools opened on April 3, “Amidst the battle, it is best to resume classes. 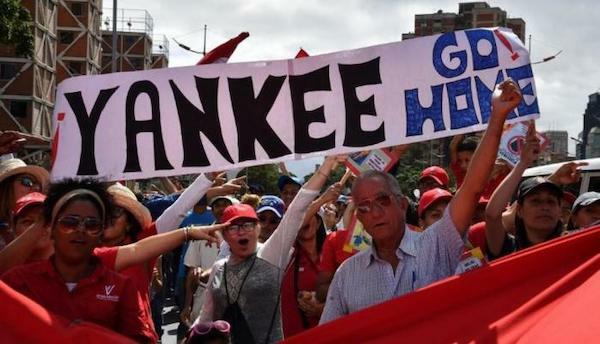 Let’s make an effort, because we will emerge victorious,” Maduro said, leading the response to this war planned and carried out by the United States, to make life in the country unbearable. The national government instructed the Ministry of the Popular Power for Education to reschedule the school year and recuperate the days lost. At the same time, a 30-day plan to implement a load administration regimen, with the goal of gradually restoring the national electrical grid to serve the Venezuelan people, was launched Sunday, March 31st. The Venezuelan people have responded to every attack, every attempt at destabilization, a response that never ceases to amaze the world, and should serve as a warning to the masters of chaos. The values ​​that the Chavista revolution has nurtured over the years are an antidote to shock therapy. Klein, Naomi. The Shock Doctrine: The Rise of Disaster Capitalism.